QUESTION: Mr. Armstrong: I have watched in amazement how you connect all these elements. Everyone I spoke to agreed this was your best WEC ever. You have said the Fed needed to raise rates because of the pension crisis and it would have nothing to do with inflation but it has to normalize rates to help pensions. Then we have the ECB refusing to raise rates. Would you please comment on the Fed’s actions yesterday? Is this a central bank war? ANSWER: I understand this can get confusing because there are so many people who talk without any real-world experience. The Fed MUST raise rates to help the crisis in Pension funds. 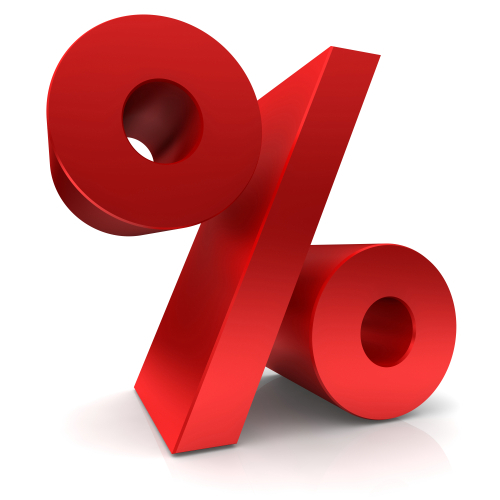 It raised the Fed Funds Rate (what banks charge each other) 25 basis points to 2.25-2.5%. While the Fed indicated there would be two more rate hikes in 2019, what has gone over everyone’s head is exactly what I have been warning about. We are witnessing indeed not a Currency War but a Central Bank War. Those people claim there is a Currency War because they focus only on trade. I do not see any actual counter-trend manipulation attempts as was the case with the G5 back in 1987 to manipulate any currency for trade purposes. This is a brand new Central Bank War that nobody seems to get I suppose since I may be the only person who actually speaks to central banks outside the USA. All the various central banks and the IMF have been lobbying the Federal Reserve since 2014 pleading with it NOT to raise rates. I have stated many times that the rate hikes by the Fed have NOTHING to do with economic growth, inflation, or trying to stop a speculative bubble in stocks. We can see that GDP growth since the high back in 1978. That may come in the future when the stock market rallies, but not now. The lobbying behind the curtain against the Fed raising rates has been very intense. What is most interesting is that BECAUSE of what the New York boys did to me, outside the country it has been a badge of honor and a CONFIRMATION that I am NOT one of them and I am independent. Hence, I meet with central banks outside the USA because I am someone who knows the real game behind the curtain, have 30+ years of real-world experience, and work internationally. That has made me fill a rather unique role with a front row seat to the world. I have written before: “The talk behind the curtain remains that the Fed is still under pressure to PLEASE don’t raise rates. The lobbying continues from the IMF, ECB, and Emerging Markets.” (see Aug 2, 2018, Post). I cannot say this any stronger! The Fed is dealing with reality. It MUST raise rates, not for the economy but in order to NORMALIZE interest rates because lowering rates makes it cheaper ONLY for borrowers while it destroys the philosophy of saving for your retirement when you cannot earn enough interest to buy a nice dinner. 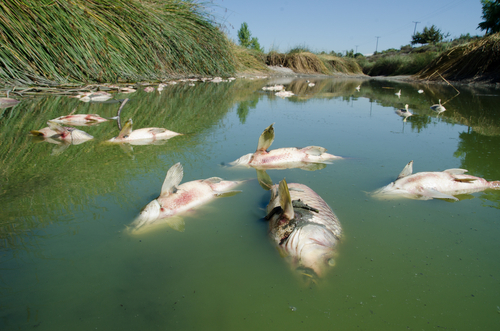 Then pension funds are going belly-up like the fish in a polluted pond. 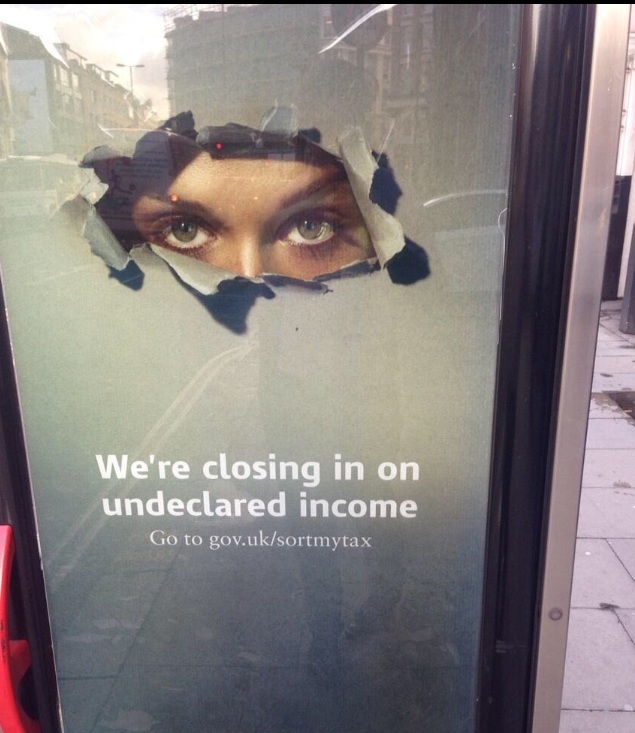 State pension funds then turn to their respective governments who then raise taxes lowering the standard of living (i.e. California & Illinois). The ECB is trapped and I have warned that it is the ONLY central bank that can actually go bankrupt because all central banks do not have the same structure. I have made it clear that by their very own standards, the ECB itself is insolvent. At the end of 2017 in the USA, total household debt exceeded $13 trillion. Total non-financial business debt stood at $6.1 trillion at the end of 2017. The Fed’s balance sheet was $4.4 trillion of which $2.4 is US Treasuries – the bulk of the rest is simply excess reserves. The national debt stood at $20.5 trillion at the end of 2017. 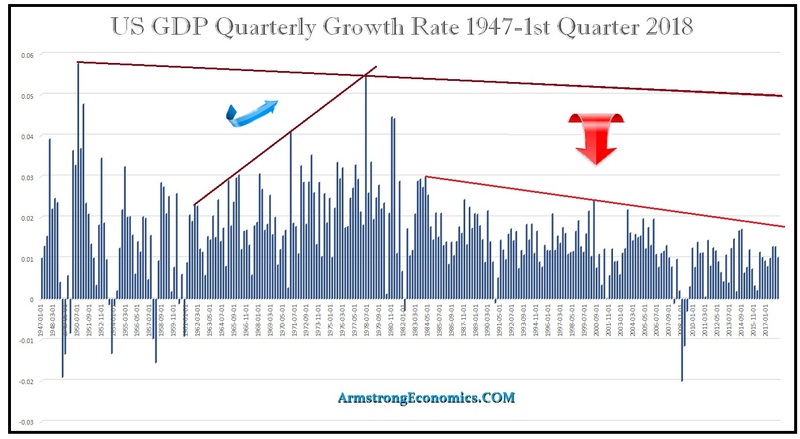 That meant the actual Quantitative Easing was not $4.4 trillion, but $2.4 or about 10% of annual GDP compared to Europe at 20% and Japan over 100%. If we look at this perspective, this means the money supply is $41.6 trillion just using the debt. If we then add M2 (all accounts & money market accounts) which stood at $13.8 trillion at the end of 2017, this brings us to a liquid money supply of $55.4 trillion. The Fed’s balance sheet does not even reach 10% of that figure and the QE portion is less than 5%. Do you understand why the goldbugs were dead wrong on hyperinflation? Now let us add the stock market, which is liquid. That reached $30 trillion by the end of 2017. Therefore, the liquid assets/cash position stood at $85.4 trillion at the end of 2017. Then let us add total personal real estate (homes) in the United States which stood at $31.8 trillion. If we include illiquid real estate, now we are up to $117.2 trillion. We are NOWHERE near possible hyperinflation! I will state this ONCE AGAIN!!!!!!!! Raising rates is NECESSARY for the Fed also realizes that come the next economic recession, the only tool they have is to lower rates. They do NOT share this theory running around that full employment will only take place with NEGATIVE rates at -4% to -5%. The ECB is looking at that BECAUSE they cannot raise rates. Why do you think the IMF is now telling everyone to adopt cryptocurrency? That way they end hoarding and can ENFORCE negative rates outlawing all private cryptocurrencies. Where politicians in Australia have called for the removal of the $100 bill claiming cash is for criminals, the Reserve Bank of Australia (central bank) has defended the embattled $100 note arguing that criminals prefer $50. The response is eliminate both. Trump wanted the wall with Mexico to stop the drug trade. The Democrats call him a racist for that even though Mexican is no more a race than American or Canadian, but they advocate eliminating the $100 bill as well. Lawrence Summers, a former economic adviser to President Obama and ex-Treasury secretary, argues get rid of the $50 bill as well. The left argues cash is for criminals in the drug trade, but then call Trump a racist for wanting a wall. Larry Summers is spouting out pure propaganda since he admits that getting rid of the $100 bill, or even the $50, won’t eliminate crime and corruption, but would make it harder for criminals to launder money. I am no fan of Larry Summers. I believe he is a very serious danger to the world economy. He was a primary architect of the modern U.S. financial system that collapsed in 2008 and was among the first to advocate negative interest rates. Summers was second in line in the U.S. Treasury in the 1990s under President Clinton and Treasury Secretary Robert Rubin. 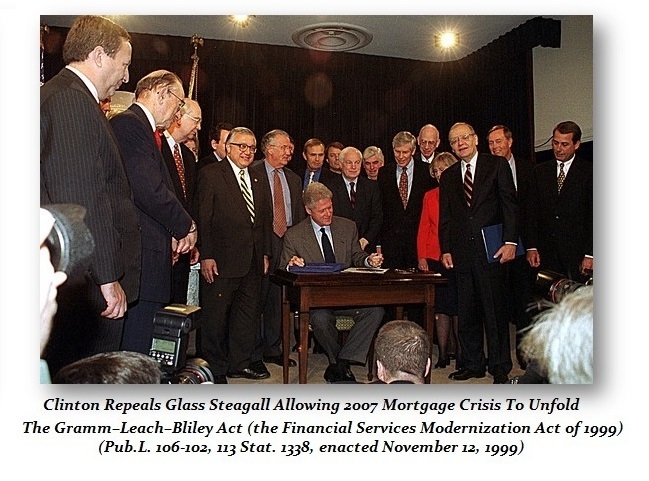 He advocated the repeal of Glass-Steagall and appears in the photo when Clinton signed that act (on the left). Summers was also there arguing the creation of “too big to fail” theory to support wholesale bailouts without any criminal prosecution for frauds. He fought against the regulation of derivatives which later played a key role in the financial crisis orchestrated by Goldman Sachs. He became Secretary of the Treasury under Clinton 1999-2001 when Rubin left after fulfilling his reason to leave Goldman Sachs – the repeal of Glass Steagal. Summers then held the position as President of Harvard 2001-2006 during the administration of George W. Bush seriously calling into question the worth of a degree in economics from Harvard. Allegedly, Summers left Harvard after a no-confidence vote by the staff following the loss of some $1.8 billion in Harvard endowment funds to a derivatives deal gone bad reported by Reuters. After that fiasco, Summers became the Director of President Obama’s Nation Economic Council. So after that loss at Harvard, he is qualified for the White House to advise on economic policy from 2008-2010 and played a key role in bailing out the U.S. banking system. Larry Summers is the guy who publicly admitted he cannot forecast the economy because it is too complicated for academics. Summers is also the architect of negative interest rates. He has stated that the natural interest rate remains BELOW zero even with the QE measures sterilizing any action of the Fed. Reducing short-term interest rates is the Fed’s greatest power according to Summers under Monetarism to bring about full employment during recessions. However, the Fed has been hamstrung by this zero-lower boundary resulting in a weaker recovery thus far. Consequently, Summer sees the larger problem is that this is not a short-term issue but systemic. He argues when another recession hits, the Fed will be impudent. This is what Summers warned of in his speech at the IMF. Summers is the man behind the curtain wanting to eliminate cash and making money national cryptocurrencies to ENFORCE negative rates. If you eliminate paper money, you eliminate bank runs. You eliminate hoarding of money (cash) and that would allow Summers to enforce a -5% interest rate stealing your money which would enrich the banks on top of the taxes you pay to the government. I am not alone in my criticisms of Summers (see Atlantic) where may see him as unyielding, unrepentant, and arrogant. He was the there at the Treasury when Clinton eliminated the right to file bankruptcy on student loans. It was the Clinton Administration that aided the bankers for on October 7, 1998, when President Clinton signed the Higher Education Amendments of 1998 (the 1998 HEA), which provided federal funding for education loans at a reduced rate of interest. However, Clinton sneaked in the 1998 HEA two specific changes regarding the collection of student loans that is a brewing part of the Sovereign Debt Crisis today for students cannot discharge student loans in bankruptcy and 65% cannot find a job in what they paid for. This has funded WORTHLESS education at outrageous prices creating a welfare system for academics to propagate stuff like global warming to screw us with even more taxes, and then bankers can lend money to students and turn them into economic slaves for life. Then in 2014, Summers admitted that student debt was slowing the housing recovery and the broader economic recovery. Student loans are preventing graduates from buying a home because of their debt position which will take decades to pay off at 7%+ interest rates. This man, I believe, is EXTREMELY dangerous to all our liberties. People ask me why I do not go into politics or take a political position to make a difference. First of all, I can make a living myself and do not need to rip off the country. Then there is the problem that I have real-world experience and do not come from the academic side with only theory. I actually advised under contract on portfolios that amounted to 50% of the US national debt (see testimony before Congress). I have experience which is not really a requirement these days in Washington. Plus I would lose my independence which is something I really cherish. One person cannot change the system. Look at Trump. The entire establishment is out to get him. Vogue Magazine even hates his wife – which is really a first. Every major media is marching in tune to drive Trump from office. There were 67 countries represented at the WEC event this year in Orlando. The press would spin that as I am advising people against the United States. They would turn my international experience into treason today. Just not interested in such a pointless battle with no prospect of success. This is why we are in a Central Bank War. There are a lot of problems taking place and the Fed knows the Pension Crisis is taking down state and municipal governments. True, they raise rates and government debts explode. But the failure to raise rates means pension funds collapse and bailouts become necessary while states raise taxes which lower economic growth as disposable income declines. So if you can move to one of the state that do not have an income tax, do so while you still can. « German Yields Decline for Lack of Confidence or Expectation of Lower Rates at the Fed?